Color Choices for Bed and Breakfast ! Vote now! 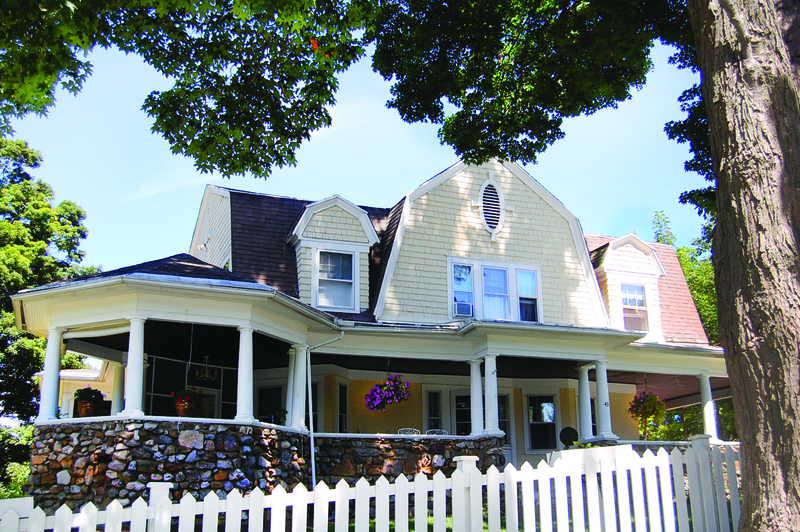 We need to paint the exterior of Hilltop House Bed and Breakfast, a daunting task, starting with what colors! 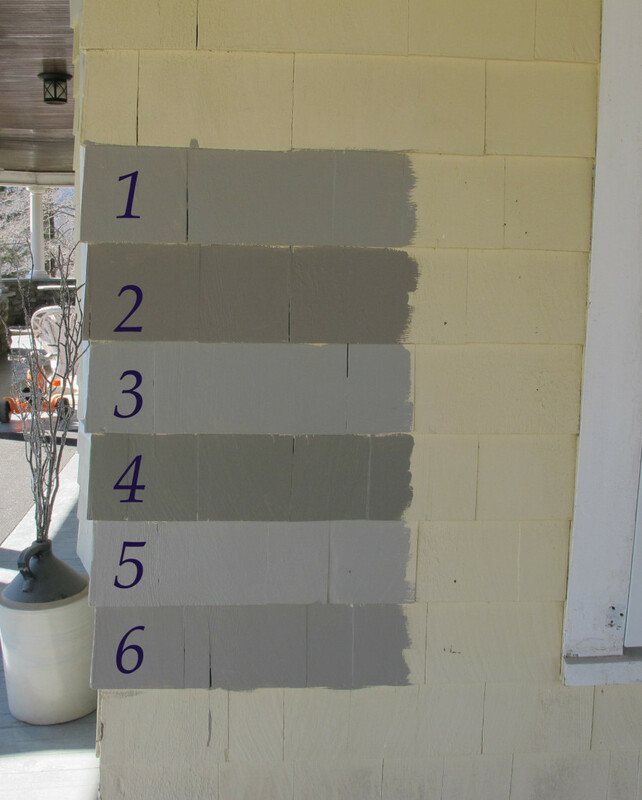 I picked up some paint samples to try on the house. Getting away from the yellow. I love the yellow color of the house, but somehow feel it is too happy for this house. Maybe with the big maple gone, no longer casting her long beautiful leaf motifs on the shingles she’s changed her personality. I was leaning towards some tone of green, but as I drove around Dutchess County or over to Litchfield County in Connecticut, I couldn’t really find any green houses that spoke to me. I was lucky enough to catch a short consultation with a NYC architect who gave me some color suggestions, so I went to the hardware store today and picked up small cans of 6 different colors in the grey family—greenish, brownish, and warm greys. I feel I have to go with warm colors because the roof is brown. Before we paint there are some repairs to rotted wood to be taken care of or replaced. We are seeing the light at the end of the tunnel. Next year there will be NO big projects to take care of. (Knock on wood.) Not even medium-sized projects. Woohoo! We will basically be done and that’s a good thing. Still not an easy decision. Maybe our blog readers should vote? Personally, I’m leaning towards the darker colors. Of course every time I look at the swatches on the house, I change my mind. My garden designer likes the top color (1) which has a slight purple undertone. (2) has more of a brown undertone and (4) has a green undertone. Now that they’re up, (3) and (5) might be a little too cool and light for the house. I need to get the trim colors and door color on there too so I can see them together. I wish I had more confidence in my choices, but running a bed and breakfast, one has to don the caps of many professions–cook, gardener, master cleaner, bookkeeper, bottle-washer, antique refinisher, and now interior/exterior designer. It’s another lesson for those who dream of becoming an inn keeper. It keeps me running. The longer I am involved in running my B&B, my motto has evolved: I try to keep things pure, simple and as healthy as possible. This dish fits the bill. I even picked the blueberries myself and froze them last fall. (She says proudly, rocking back and forth, her thumbs tucked in her suspenders!) They are as freshly frozen as possible. And the fact that they are frozen adds an especially nice texture to the dish. Mix yogurt, berries, walnuts and cinnamon together. 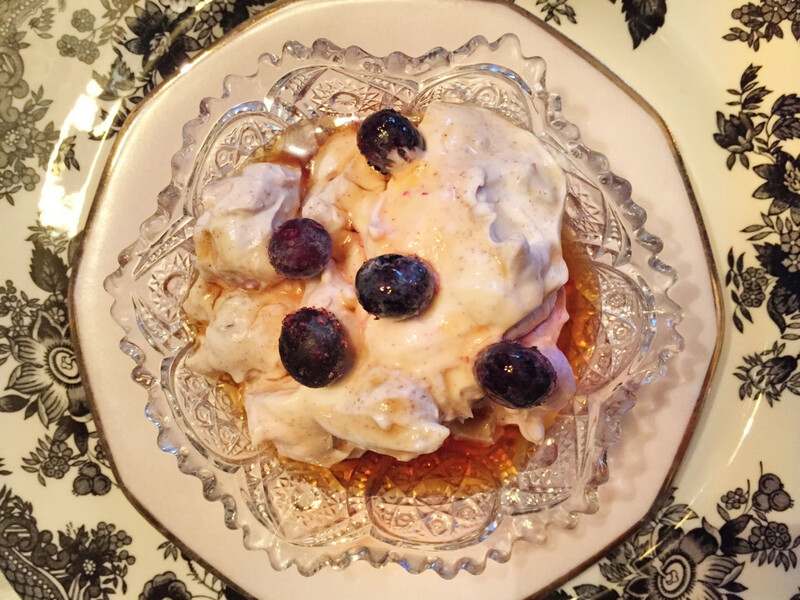 Scoop into serving dishes, top with a few blueberries and drizzle on pure maple syrup. Funny enough, it never occurred to me to serve it to my guests, but when I realized I had nothing fruit-wise one morning, I thought of my personal breakfast of this yogurt parfait, which I then made for my guests. It was an immediate hit and has been such for everyone who eats it. And the best part is it’s healthy and easy. Fits my motto. 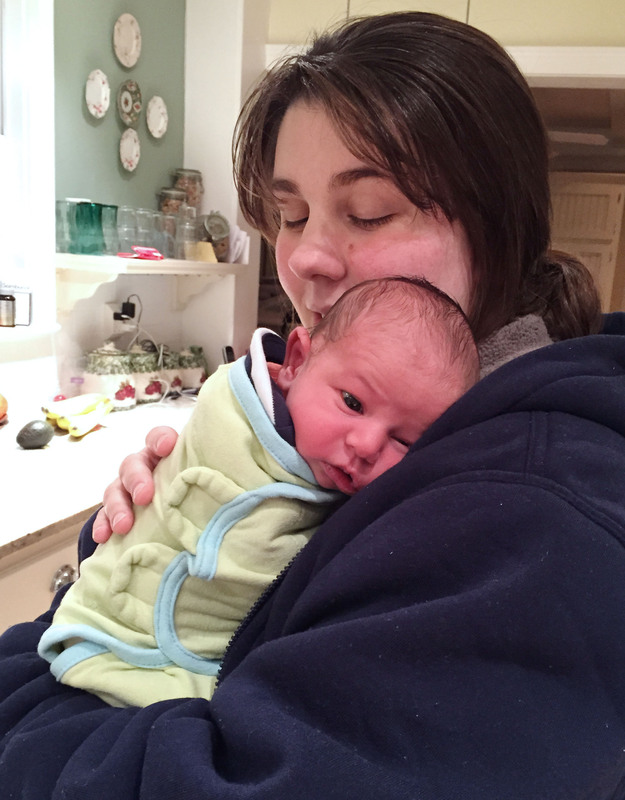 Our daughter Kelly, graced us with a fourth grandchild last month. You’ve no doubt seen the 3 girl muses traipsing around in photos of our bed and breakfast, and now we have a boy!